The new-look Twitter is here. With bigger photos and pinned tweets, the redesigned Twitter is coming to new users from today, while some existing tweeters will also be getting it imminently. These seem to be mainly high profile types, like the First Lady of the US (@flotus) Michelle Obama, but the rest of us mere mortals will be getting the new look in the next few weeks. At first glance, the multiple images and abundance of links arranged around the timeline make it seem like a bit of a mess - but we're sure we'll all get used to it and within months we'll have forgotten that Old Twitter ever existed. Such is life. The good news is that @replies seem to be present and correct. But yes, it is all a bit like Facebook, isn't it? 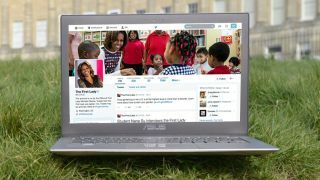 What does the web make of the new-look Twitter?